Ferroalloy Market size was estimated over USD 45 billion in 2017 and the industry will grow by a CAGR of more than 5.5% up to 2025. Rising demand for steels in end user industries such as construction, shipbuilding, automotive and several other sectors is one of the major drivers for ferroalloy market. The product has main applications in manufacturing variety of steels such as stainless steel, alloy steel, carbon steel, etc. Presence of iron ore in abundance across the globe along with intensifying demand for various types of steel grades owing to lack of feasible substitutes will give an up thrust to ferroalloy market in near future. Global crude steel production was about 1.6 billion tons in 2017, and showed a growth rate of around 5.3% in comparison to last year. The emerging nations such as China and India hold significant shares in this as the prime demand centers for steel. Some of the major automobile manufacturers are present in these countries catering to the increasing demand from the local customers. Expanding population along with improving standard of living gives boost to construction sector as well. Recent initiatives taken by governments in Asia Pacific region to boost manufacturing sector will also catapult ferroalloy demand over forecast time period. High energy consumption for producing ferroalloys along with monitoring required to maintain the product quality increases overall cost of production. Also, there are many stringent environmental regulations, and industry standards mandated by various regulatory bodies for the iron and steel production industries. 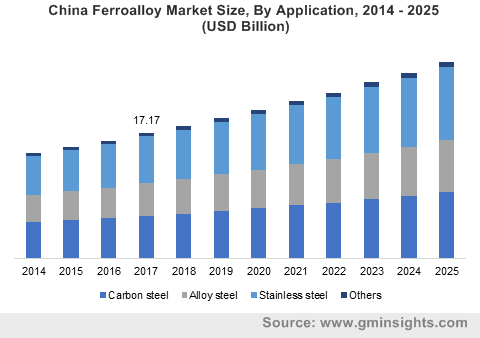 These factors, altogether, will hinder the ferroalloy market growth in coming years. Based on product, ferroalloy market is categorized into ferro chrome, ferro manganese, ferro silicon, ferro silicon-manganese and others. Among these ferro manganese shows a decent annual growth rate of about 6% over the forecast time spell. These are used in the production of steel as a desulfurizing agents. The product removes nitrogen bubbles and reduces the amount of iron oxide, which is undesirable during production of steel. It also acts as an alloying element contributor in various types of steels. Ferrochrome is mainly used in production of stainless steel. This helps in providing corrosion resistance along with aesthetics. These are also used in manufacturing tool steels and some ball bearing steels used in the manufacturing sector. On the basis of application, ferroalloy market is segmented into carbon steel, alloy steel, stainless steel and others. Among these alloy steel shows the maximum annual growth rate of about 6% from 2018 to 2025. These are majorly used in manufacturing pipes and bearings. Pipes made up of these steels have excellent performance properties and have major applications in oil & gas drilling. Alloy steel are also used to manufacture load carrying components in various types of bearings. Alloy steels have applications in various end use industries such as general engineering, aerospace & defense, railway, etc. With increasing investment in manufacturing sector of various emerging nations, the demand for alloy steels is also expected to increase in near future. Carbon steel shows a CAGR of 45.5% over the forecast timespan. It is mainly used in applications where wear resistance, hardness and strength are required such as in drill bits, wrenches, chisels, saw blades, springs, gear wheels, structural wires & cables, railway wheels, etc. The demand for ferroalloys for carbon steels will increase over the forecast time period due to increasing industrial activities in developing nations. Middle East & Africa shows a decent growth rate of about 5% from 2018 to 2025, driven by growth in construction sector of the region. Middle East has a significant number of skyscrapers and stainless steel is used predominantly to build these structures. Also, with presence of oil & gas reserves all across the region demand for steels used in pipes, casings, tubes, etc. is very significant. Ferroalloy products are used in upstream, midstream and downstream segments of oil, gas and other petrochemicals. Rising crude oil production & exploration activities and measures taken by governments of various nations of the region to boost industrial sector will catapult demand for different type of steels. This will subsequently augment the growth of ferroalloy market over the forecast time period. 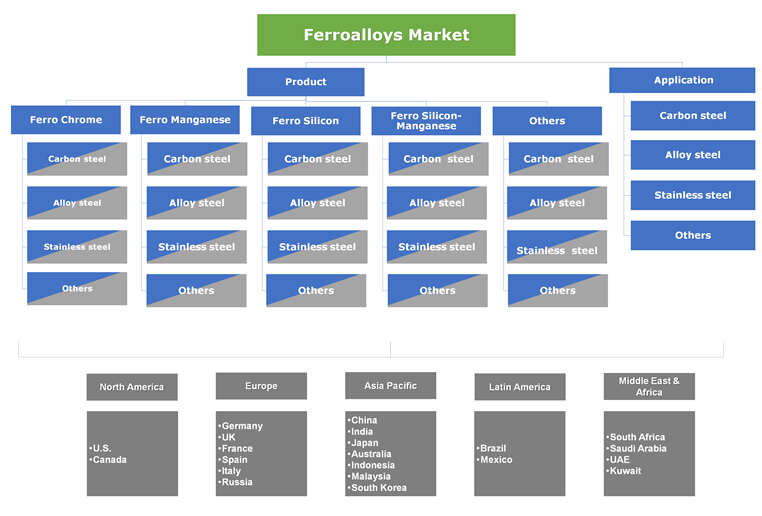 Some of the major players in ferroalloy market are Tata Steel, Arcelor Mittal, OM Holdings, Gulf Ferroalloys, Brahm Group, Ferroalloy Corporation Limited, SAIL, Sakura Ferroalloys, Eurasian Natural Resources Corporation, S.C. Feral S.R.L., Jindal Group, China Minmetals Corporation, Pertama Ferroalloys, Nikopol Ferroalloy Plant, and Shanghai Shenjia Ferroalloys. Most of these companies are well established and have significant share in this resourceful market. These players are adopting organic and inorganic growth strategies such as increasing production capacities, acquisitions and mergers. This is done in order to have a greater hold on the market. Ferroalloys market will progress in positive direction due to there ability to enhance properties of various types of alloys and steel. They help in adding various alloying elements in desired quantities in the most technical and economic ways. The product plays a very significant role in industrial development. The major end-use of ferroalloys is in automotive, railways, construction and various mechanical engineering industries. High energy consumption during production along with increasing fuel prices across the globe may hinder the growth of market in coming years.